MOUNDS VIEW, Minn. – Here we are, quickly approaching the end of 2015. It’s seriously weird to think that 2005 was 10 years ago. In my mind it was about three years ago. Alas, another year has passed – a year that for me was a bit underwhelming if I’m being honest. I was a race winner, perfected my podium champagne spraying skills 12 times and claimed third in the Cooper Tires USF2000 Championship Powered by Mazda. That all sounds like a pretty solid year but, personally, I know there was more to be had. There is no way I’m letting that happen again, so I hit the ground running for 2016 starting almost right away after the Mazda Road to Indy season finale at Mazda Raceway Laguna Seca in mid-September. Since then I have been in a car eight days at five different tracks driving for six different teams. I haven’t passed up an opportunity to drive a car at all and it has been amazing. I headed firstly to Sonoma for a one-day test with Juncos Racing. It was my first time in a Pro Mazda car so I had to get to know her ins and outs in the first couple sessions. Then, as luck would have it, it started to rain for the first time all summer in California. So I got to go out and get some wet laps in the Pro Mazda on my first day in the car! The Juncos guys were great and it is no wonder they are always putting cars to the front of the grid. I then headed back to Minneapolis to work at the Minikahda Club where real life set back in for a bit (being 23 has its downside). Luckily, real life was short lived as I was able to hop in a Pabst USF2000 car at the Autobahn for a day. The Pabst guys were super fun to work with and their car was seriously fast. After another brief stay in Minnesota, once again an opportunity popped up that I couldn’t refuse, and I headed back out to Sonoma for a one-day test in a World Speed Pro Mazda car! This time sunny California didn’t disappoint and I was able to get in a full day of dry weather driving. 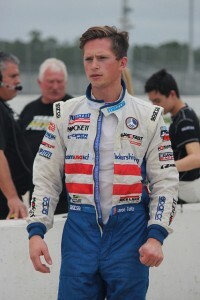 I got the chance to work with Memo Gidley and really got comfortable in the Pro Mazda. The World Speed guys did a great job getting me up to speed and gaining lots of confidence in the car. I went back to Minneapolis and was looking forward to Thanksgiving and going to watch the Green Bay Packers play the Minnesota Vikings. I was lucky enough to get tickets from my cousin for the game! But once again a chance to hop in a race car landed in my lap. 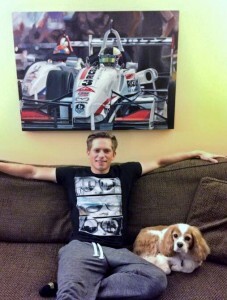 Jeremy Shaw called me up and told me about a new USF2000 team (RJB Motorsports) who would like some help getting their car and program up to speed. So, after giving up my Packers vs. Vikings tickets, I flew down to Austin Texas for the Chris Griffis Memorial Mazda Road to Indy Test at Circuit of the Americas! Armed with my driving gear and my secret “Text Message Engineer” I was ready to get the RJB boys up to speed. The first day was a little challenging as we were battling an electrical gremlin which limited our laps, but I was able to tell that some serious changes were needed to get the car handling properly. I got some top secret tips from my “TME” and the RJB boys made the necessary changes. 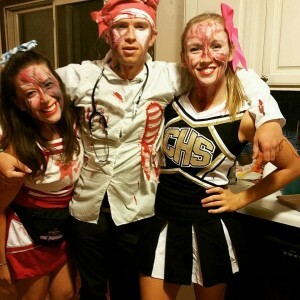 They were just what the doctor ordered. I felt the car was working well in the first practice session of day two, so we went for a new set of tires and I was able to put in a lap good enough for P2. Not a bad start for the team and the car and so I felt confident handing the reins off to Clint McMahan for the rest of the day so he could get himself up to speed! As any homeless race car driver would do, I went and found another car to get in for the rest of the day. And as luck would have it the Pabst boys had an extra car lying around which I was able to hop in and do the final two sessions of the day. I had a productive two sessions improving both the car and my lap times and ended the day with the second fastest time. Again I found myself back in Minneapolis doing grownup things like picking up a job at the Mall for Black Friday. This turned out to be absolutely insane as I got to experience all the craziness of Black Friday from behind the battle lines. Thankfully, I escaped the Mall unharmed and headed to Florida for three days of testing in three different cars. Part one of my Florida adventure began at Andersen Racepark. If you get the chance to drive the rental karts at Andersen Racepark you will get the opportunity to admire my actor skills in the new safety video! You can make fun of me all you want but hey, I have just as many Oscars as Leonardo DiCaprio. After my short career in front of the camera I headed down to Palm Beach International Raceway with Team Pelfrey. 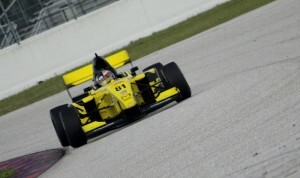 The first day I was behind the wheel of one of their Pro Mazda cars. 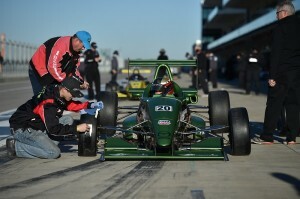 Being my third day in a Pro Mazda car I felt really comfortable and had a super-productive day. 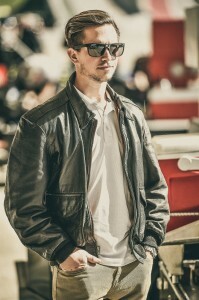 Working with the Team Pelfrey guys was a pleasure and everything went off without a hitch. On day two I hopped into one of their USF2000 cars. I was able to get a good read on the car and make some solid changes to get the car working better. Unfortunately, some Florida rain crept in before lunch so our run plan got a little derailed. But overall it was a great day and an awesome experience to drive another car. My Florida adventure next took me to Sebring for a day in an ESM Prototype Lites car. Sadly, the car I was set to test had a bit of a mechanical problem the day before. Ryan Dalziel was driving it at the time so I obviously blamed him! I was still able to hang out with the ESM guys and talk with Scott Sharp, who assured me I’d get a chance to drive the car later this winter. So it’s been an awesome off season so far. Lots of driving and lots of new experiences with new teams and new cars! I’m pretty sure I have now worked with more Mazda Road to Indy teams than any other active driver (seven). I feel like this is a huge advantage as racing is definitely a team sport. The right team can extract the most out of a driver and the right driver can extract the most out of a team. So having the right combination of team and driver is so key to success in racing! I am now busy getting everything rolling so I can be on the grid in 2016. A huge thanks to everyone who has and will continue to support me in 2016 and beyond, including Rice Lake Weighing Systems, Fred Thomas Resort, Already There Property Management, Team USA Scholarship, SAFEisFAST, Mazda and Cooper Tires. Nothing is set in stone yet for 2016. What if I come back for a third year of USF2000? Or maybe a car with fenders is in my future? I feel more than ready for the move up to Pro Mazda as well. You never know what might happen in the world of racing but I’ll guarantee you that you’ll see me on the grid in 2016 if “yellow” what I mean.